Zero chance of coming to SA but one very stylish Opel. "Vauxhall has released first pictures of the all-new Insignia, known as the Vauxhall Insignia Grand Sport, which will receive its world premiere at the 2017 Geneva Motor Show in March 2017. Following on from the previous generation, which won the European Car of the Year in 2009, and sold over 30,000 in the UK in 2015, the Vauxhall Insignia Grand Sport is based on a completely new vehicle architecture. Its revised proportions result in a more spacious interior, giving the car a more athletic appearance and an improved road stance, including class-leading aerodynamics and Cd figure of just 0.26. Outstanding infotainment and connectivity are also on board thanks to the latest generation IntelliLink systems and Vauxhall OnStar, which with the launch of the Vauxhall Insignia Grand Sport, will offer even more functionality for customers. "Vauxhall is raising its game even further with the launch of the new Insignia Grand Sport," said Rory Harvey, Vauxhall's Chairman and Managing Director. "It has all of the virtues of its successful smaller brother the Astra, and takes those to a higher level. The Insignia Grand Sport will set new standards for design, efficiency, technology and connectivity when it debuts next year at the Geneva Motor Show." The new Vauxhall Insignia Grand Sport hatchback has been unveiled, and reveals Vauxhall's plan to steal sales from executive saloons such as the BMW 3 Series and Mercedes-Benz C-Class. The Insignia Grand Sport is a new name for this second-generation Insignia, which is seen here for the first time ahead of its Geneva show debut in March and UK deliveries in June. The new range will be crowned by a 247bhp turbocharged 2.0-litre petrol version with all-wheel drive. The five-seat, five-door Insignia Grand Sport is based on an all-new and modular General Motors platform called Epsilon 2 (or E2 for short) that allows the car to be up to 175kg lighter than the model it replaces, despite a marginal increase in size. The base model weighs around 1400kg. The Insignia Grand Sport also brings with it a new look, inspired by the well-received Monza concept car of 2013, which will be ushered in across the rest of the Vauxhall range in due course. oh that brown upholstery and the interior ... out of this world. Side profile looks rather good. While handsome, it does remind me of a certain Hyundai model. Sonata I think. Auto Evolution managed to get some pics from a recent press photo shoot. Not sure which one. Might even have been a Kia. But the styling is similar. There will be Hyundais with similar looks. Their EU HQ is in Rüsselsheim right across the road from Opel... just saying. Since its release in 2009, the Opel Insignia has done respectably well in international markets with it selling roughly 900 000 units to date. With it being the flagship model of the Opel badge this new one, the Insignia Grand Sport, has some big shoes to fill. The new model is slightly bigger than before, with a wheelbase increase of 92 mm, providing it with more interior space as well as a boot capacity of 490 dm3. The new design layout also helps it shave off 175 kg and provide it with a Cd of 0.26. Interior trim also falls in line with the executive theme as it makes use of leather upholstery and black gloss finish trimmings. The new touchscreen MultiLink infotainment system is also included in the package. Although engine options are yet to be detailed, they will all be turbocharged and mated to an eight-speed transmission. Certain models will also gain an all-wheel drive system with torque vectoring to sit upon a new five-link rear suspension. Other features such as LED headlamps, various safety options (lane departure assist and adaptive cruise control) and a HUD for the driver are also mentioned. Like the previous model, it is unlikely that the Insignia Grand Sport will be introduced to the South African market but it will be interesting to see if it can continue its success in a world now dominated by crossovers. This is Opel’s new flagship sedan, the Insignia Grand Sport. It’s gorgeous but if you live in South Africa you won’t be able to buy one because South Africans don’t buy medium-to-large sedans that don’t have fancy badges on the bonnet. You can’t really blame GMSA for not considering this, then, when they’d only realistically sell about 0.027 units a year. So what are we missing out on then? 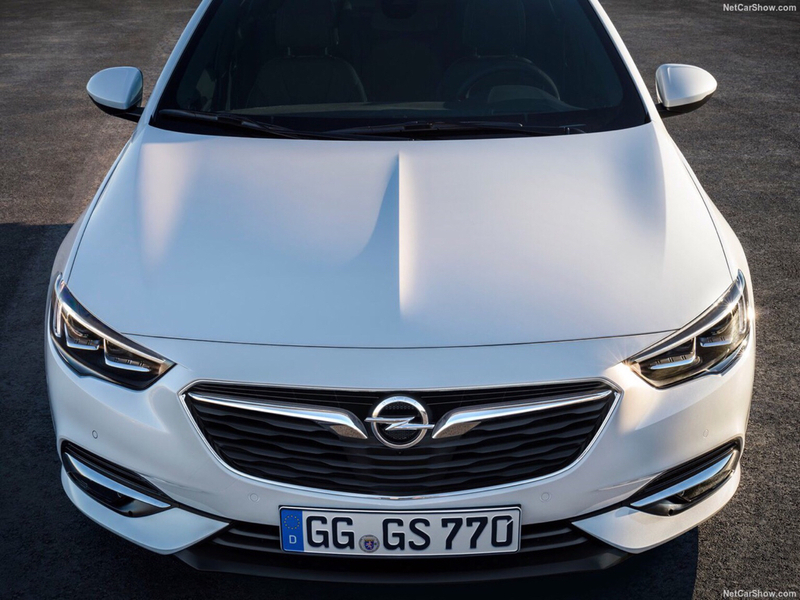 Built on an all-new platform, the Grand Sport is up to 175kg lighter than the first-generation Insignia and top models feature an all-wheel drive system with torque vectoring, and which Opel claims is the most sophisticated in its class. Also making its debut is an eight speed automatic gearbox and second-generation Intellilux LED matrix adaptive lighting system. Opel hasn’t mentioned any engines yet, but the Aussie Holden version (which will also be the first Commodore that’s not rear-wheel driven or produced Down Under) has been confirmed with a normally aspirated 3.6-litre V6 petrol engine rated at 230kW. European Insignia models are likely to be powered by 1.6- and 2-litre turbo four petrols, with a few turbodiesels thrown in for good measure. Holden has revealed first images and more details of the all-new Holden Commodore ahead of its Australian launch early in 2018. The next-gen Commodore takes cutting-edge safety, driving and infotainment technology and makes it available for today's Australians, everywhere. The next-generation Holden Commodore is democratizing technology. Now with images of the next Commodore breaking cover, Australia gets its first look at the sleek and sophisticated design that will be hitting Australian roads in 2018. Designed in Germany by the Opel team with input from GM Holden's team, the new Commodore takes the best of Europe and makes it great for Australia. Building on information released last month regarding the next-generation Commodore, Holden has today confirmed a raft of premium technologies will make Commodore the most technologically-advanced Holden ever. From potentially life-saving safety technology features, to active driving technology and seamless infotainment, the all-new Commodore will make driving safer, easier, more involving and more connected than ever before for Australian customers. This time it beats the Passat on all levels, even the A4 and C-class too.